Mass Transport is part of a free web series, GWB Online Academy, by Aqueous Solutions LLC. 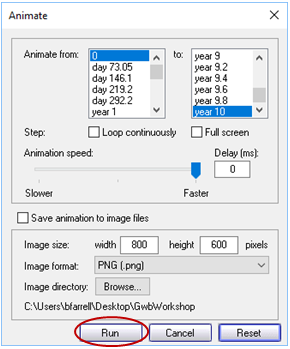 Click on a file to open, or right-click and select “Save link as…” to download. Let’s construct a model of how a contaminant might migrate in flowing groundwater, neglecting for the moment the possibility of chemical reaction. In our model, inorganic Pb contamination passes into an aquifer. After 2 years, the source is removed and the aquifer is flushed with ambient water. We’ve specified here that the aquifer be filled initially with clean water. we’ve set start and end times for two reaction intervals, the imbibition and elution legs of the simulation. We’ve additionally designated two fluids, “contaminated” and “flush”, to flow into the left side of the domain during the imbibition (start) and elution intervals, respectively. 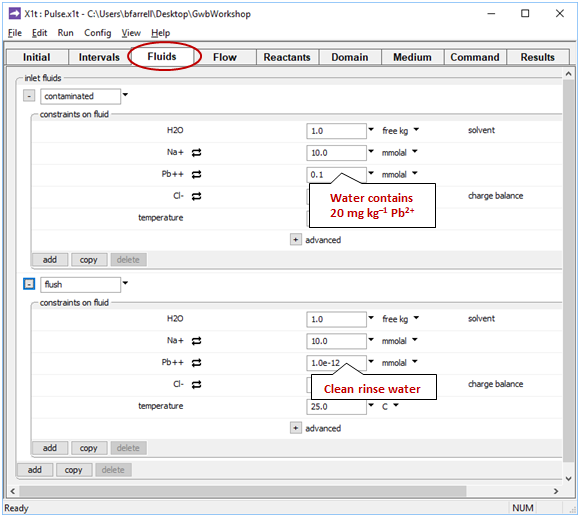 as well as the “flush” fluid: clean rinse water that will flow in during elution. 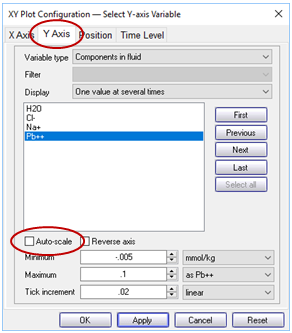 A positive specific discharge indicates that fluid will flow from left to right. 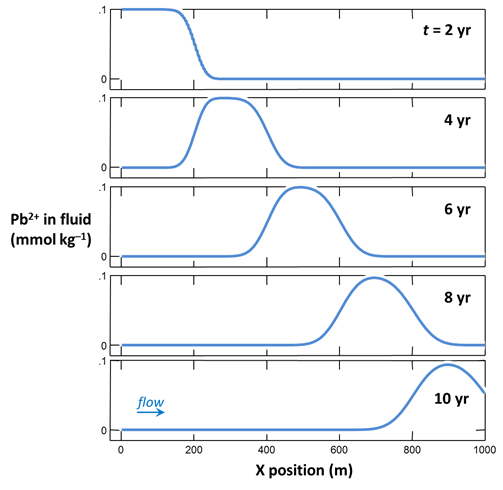 The simulation spans 10 years, so given the porosity and discharge values we’ve set, the fluid in the aquifer will be displaced once over the course of the simulation. 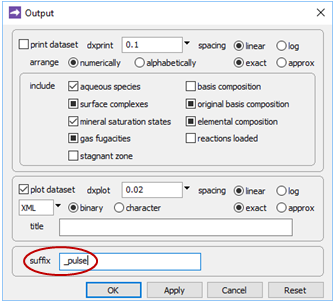 The suffix will be appended to the names of your output datasets, so you can go back to examine the results without rerunning the model. 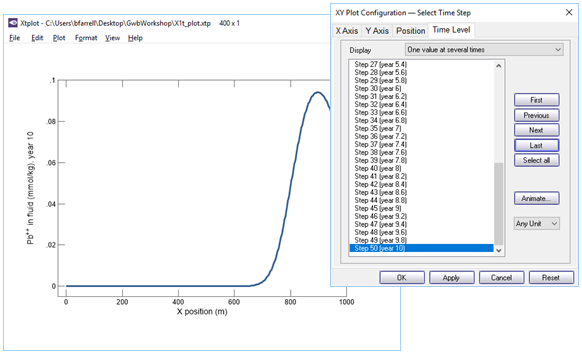 Click OK .
and click on the Plot Results button to launch Xtplot . and click on the Run button. How does the shape of the pulse change as it traverses the aquifer from left to right? As you can see, the solute pulse is translated from left to right across the domain due to advection. As it migrates, the pulse spreads out and the peak concentration attenuates somewhat due to hydrodynamic dispersion. 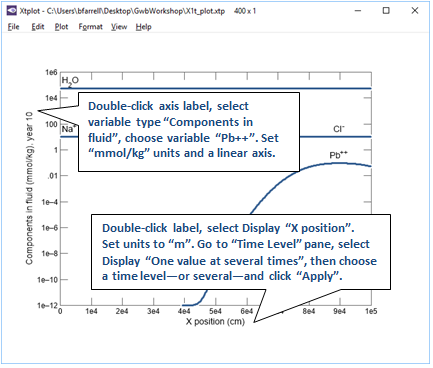 Here's a video showing you how to construct the model and plot the results. How was our first model solved? The solution to a reactive transport problem is found using the "divide and conquer" strategy. 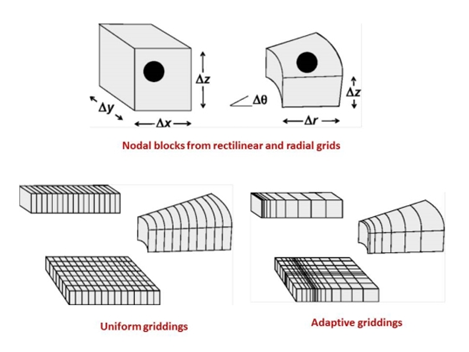 A continuous domain is discretized into a number of nodal blocks, each of which has a single value for porosity, temperature, pH, etc. 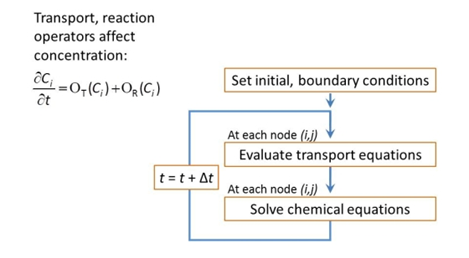 Continuing with the "divide and conquer" strategy, the numerical model uses a technique called “operator splitting” to solve the transport equations separately from the reaction equations. Now that you have a little more understanding of the numerical solution, let's get back to the physical problem. Specifically, what's the role of dispersion? Look at the illustration below. 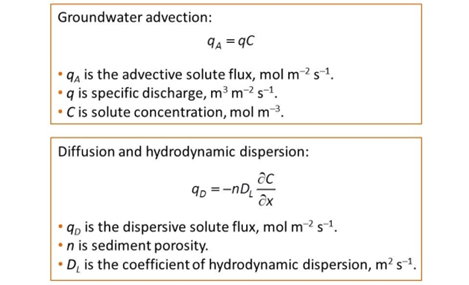 Dispersion results from physical mixing of flowing groundwater. 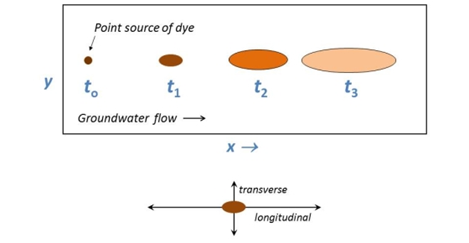 A drop of dye dissolved in the water would spread out as some of the water molecules take more tortuous paths through the aquifer than others. How does dispersion affect contaminant migration? Let's find out. Click OK , then on the main window select Run → Go. 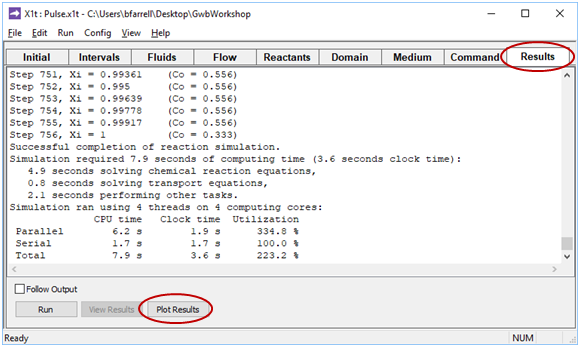 When X1t finishes, launch Xtplot to render the results. Compared to the first model, how have the results changed? By increasing the dispersivity value, we prescribe a higher coefficient of hydrodynamic dispersion. As a result, the solute pulse broadens significantly as some solute moves ahead of the average groundwater flow, and some lags behind it. With greater dispersion, attenuation of the pulse from dispersive mixing becomes apparent. You can compare side-by-side instances of Xtplot. Double-click on “X1t_plot_pulse.xtp” to render your earlier results. If you feel ambitious, you can build up a composite diagram in MS PowerPoint to show both results in one diagram. This movie shows the results of X2t simulations of the migration of inorganic Pb through an aquifer. 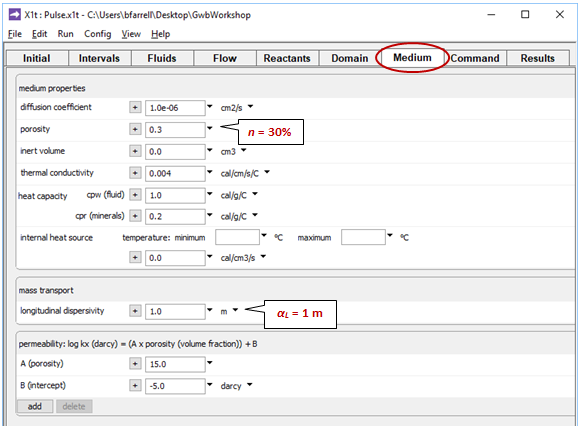 The contaminant, taken in the simulation as non-reactive, leaks into the aquifer over a period of 1 month and is entrained in the flowing groundwater. Craig M. Bethke and Brian Farrell. © Copyright 2016–2019 Aqueous Solutions LLC. 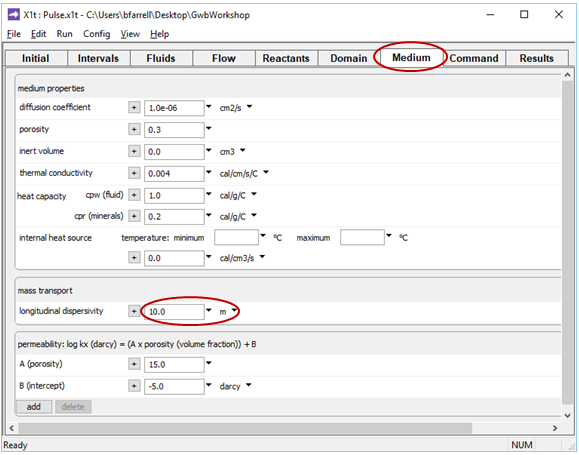 This lesson may be reproduced and modified freely to support any licensed use of The Geochemist’s Workbench® software, provided that any derived materials acknowledge original authorship. Anderson, M.P., 1984, Movement of Contaminants in Groundwater. In Groundwater Contamination, National Academy Press, 37–45. Bethke, C.M., 2008, Geochemical and Biogeochemical Reaction Modeling. Cambridge University Press, New York, 547 pp. 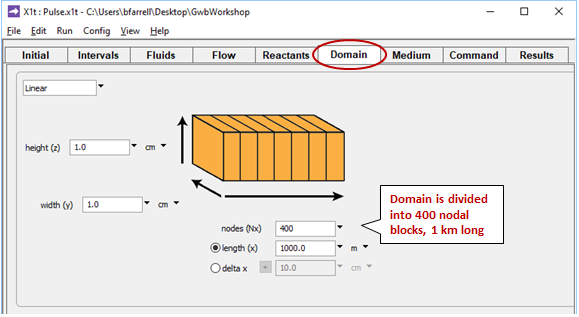 Bethke, C.M., B. Farrell, M. Sharifi, and S. Yeakel, 2019, The Geochemist’s Workbench®, Release 12: GWB Reactive Transport Modeling Guide. Aqueous Solutions LLC, Champaign, IL, 187 pp. Freeze, R.A. and J.A. Cherry, 1979, Groundwater. Prentice Hall, Englewood Cliffs, NJ, 604 pp. 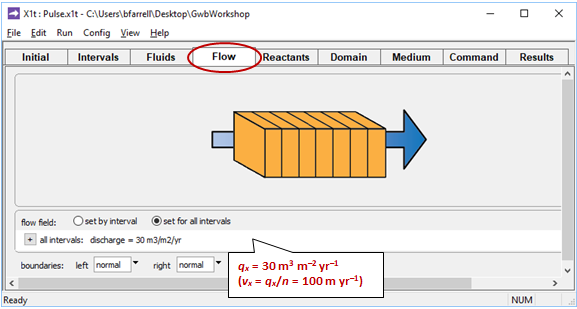 Move on to the next topic, Numerical Dispersion, or return to the GWB Online Academy home.